Wow, 52 Quilts readers are off to a great start in 2014! Look at these great finishes! If you're new to the "12 UFOs" Challenge, here is a link to the post explaining how it all works. 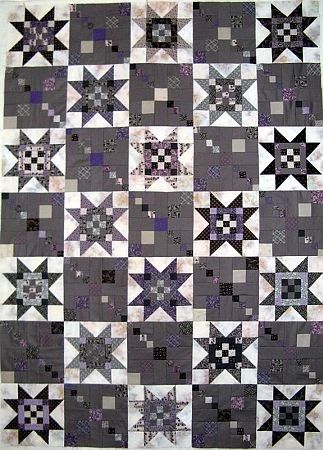 I'll be putting together my "Amish With a Twist" BOM quilt this month. I have an exciting color for the background, in place of the black called for in the pattern. Just wait and see! The quilt is not actually mine. It belongs to a friend that started it for his son about 12 years ago. It was really before t-shirt quilts were popular, and the man didn't know much about quilting. He was unhappy with the results, so he just wadded it up and threw it in an old trunk. When he moved last year, his new wife found it and decided that it needed to be fixed and finished to give to his son. 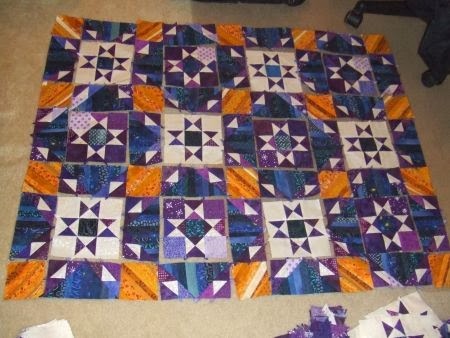 I had to rip out all of the seams, which were of varying widths, press, press onto a stablizer, and trim each "block". Unfortunately, none of them were even close to being the same size. Some of them also had holes or missing bits, so I had to patch them. 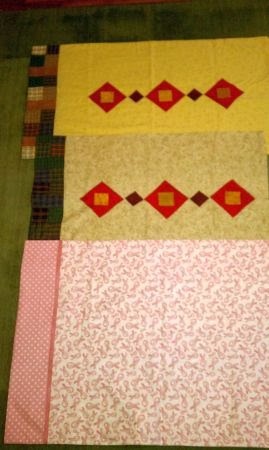 After extensive quilting math and remeasuring, I trimmed each to its final size and began sewing them together. 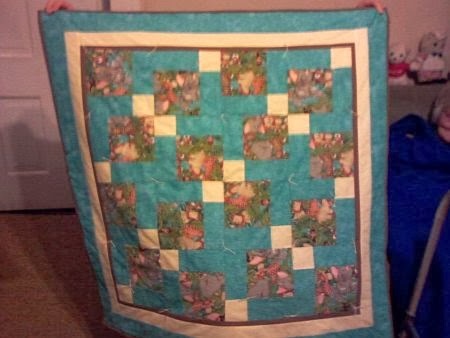 After adding borders to both the front and back, I quilted it using a neverending square design. Both challenging to mark, and move around my regular sewing machine. 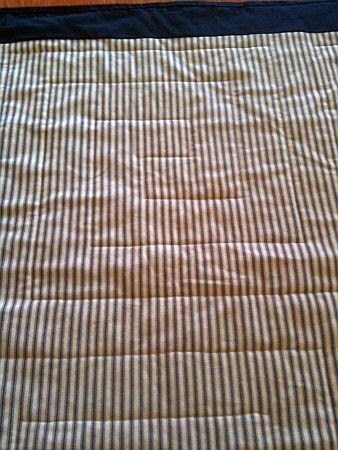 (I am not a longarm quilter.) There were a total of 12 of these squares. Joy, this is truly a work of love! 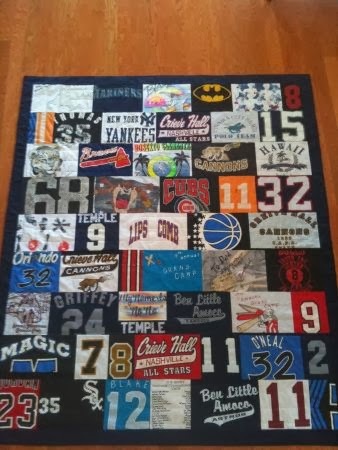 I have refused many requests to make t-shirt quilts, and re-making one is a credit to you. I hope you'll be back next month with another finish. Sue finished her Star Surround for a baby who might be here by now (due February 1st)! 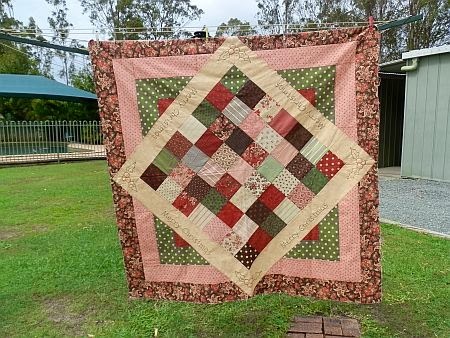 Be sure to stop by her blog, Sue's Quilty Bits and Bobs, to read the whole story. 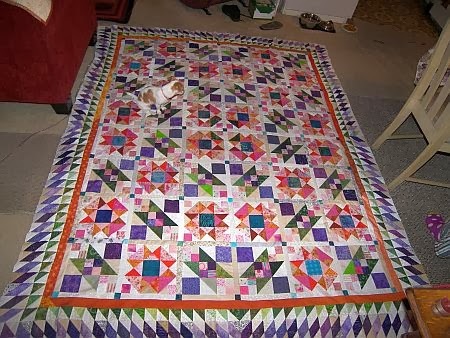 Sue, the quilting on this is gorgeous! 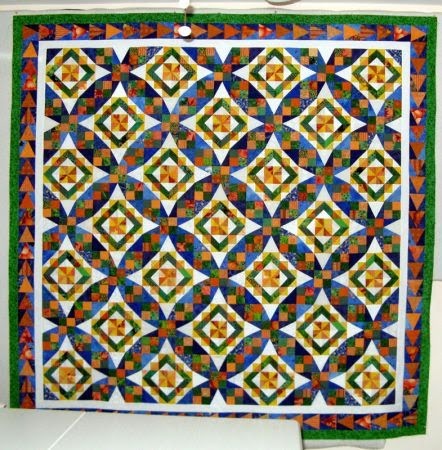 Donna reports this quilt was made for the Vermont Quilt Festival Block Exchange. 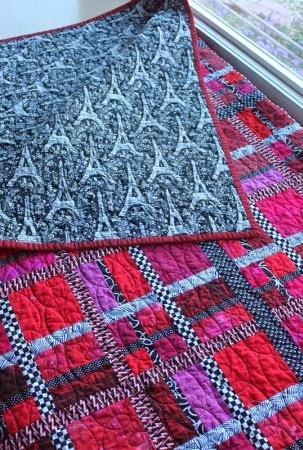 She had five of the six blocks hand quilted and now it's finished! We'll see Donna again this year, she says she has a "dauntingly large" number of UFOs to finish! 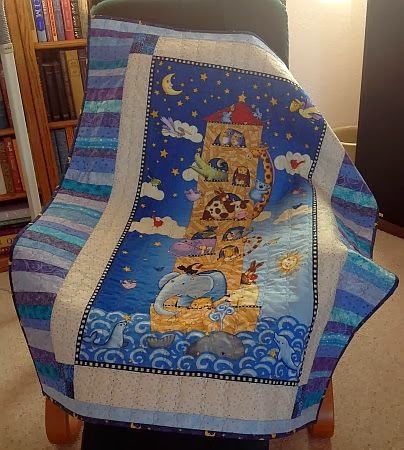 Carol Anne made this darling Noah's Ark quilt for a little boy whose Daddy is a recently-commissioned Navy Chaplain. She says she doesn't usually use panels, but who could resist this one? Happy (belated) Birthday, ChristieLeigh's Auntie -- I bet she loves this quilt! 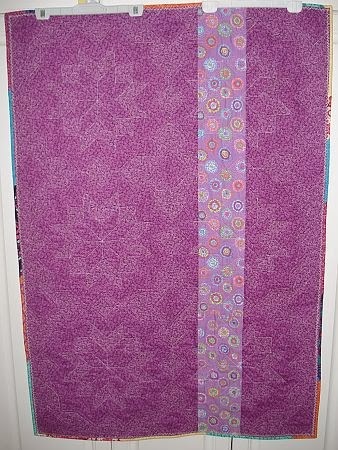 I'm going to show it to my Jelly Roll Party group and suggest we add it to our list! 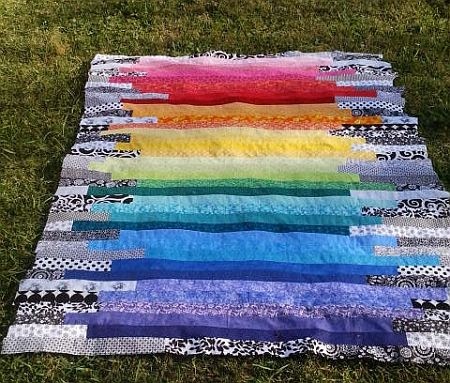 The next quilt is testament to the power of social media. Katie's younger sister was a good friend of mine who also played flute in the school band. 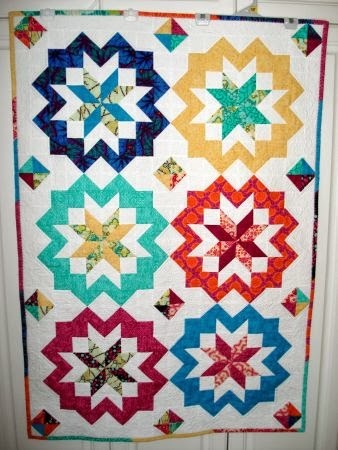 Peggy saw one of my quilts on Facebook and encouraged her sister to follow 52 Quilts. With a little urging, Katie submitted this quilt for our parade. I bought the fabric in April 2012. It is 4 charm packs and about 8 yards of background fabric. My husband did the cutting for me as I had wrist surgery in December and couldn't put any pressure on my wrist. He just asked me two days ago if I needed any more fabric cut. Cute, huh. I need to borrow Katie's DH! 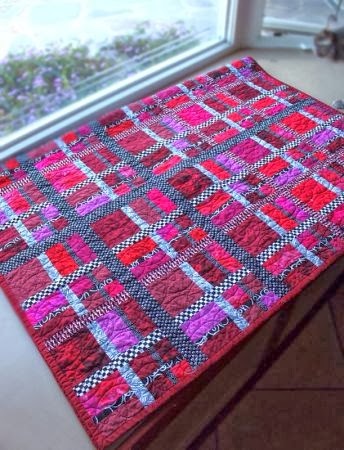 I love this next quilt, from another first-time challenger. Elisa calls it "Zombie Lipstick," although her DH prefers "Zombie Apocalypse." She named it because it has "every shade of red under the sun, just like a Revlon display." Revlon Red is my all-time favorite lipstick color! Isn't it great? 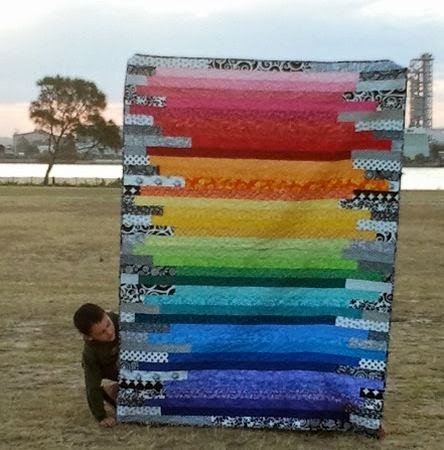 Go here to read Elisa's blog post about this quilt. She even used Susie's Magic Binding to bind it! I didn't have 12 true UFOs (as in actually started) this year so I included projects that I wanted to do or I had got as far as bundling up a pile of fabric for. I consider "kits" of quilt fabric and patterns to be a "UFO." 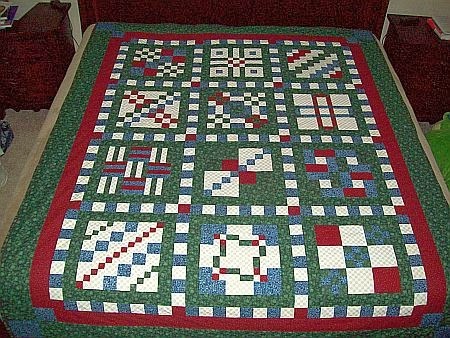 Remember, in the 52 Quilts UFO Challenge, YOU decide what is a UFO, as well as what is "done!" Number 7 was a pile of scraps, sale remnants and fat quarters with a vague idea of a Bonnie Hunter Scrappy Trip. I started cutting on New Years Day and finished last night! This is the first time I have ever done so much in one month - thank you for the motivation, it really focuses the mind - plus I didn't want to fail in Month 1! I really don't know how you manage one quilt per week. Wow, Gill, good on you! I have to say, I always look forward to Sandi's kwilts -- because the names always begin with "K!" 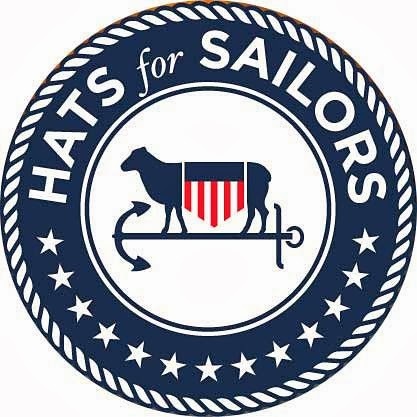 My Konqueror, the #7 UFO for this month, is a design by Joyce Weeks of Geoff's Mom Pattern Company (www.geoffsmompatterns.com). 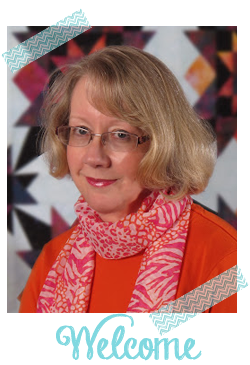 I took a class from her at the San Diego Quilt Show last year in September. I decided to make mine a bit smaller than the pattern, opting for a 50" x 70" finish rather than 70" x 90". Now you might say I was trying to cut corners to finish in time for the month...but no...I really didn't want to make yet another large quilt. I really enjoy the experience of the many designs I come across, smaller sizes when it can be done are perfect. I have a paisley print to use for the back in all the right colors along with the dark gray for the binding. Go to her blog post from yesterday to read all the details, at KwiltnKats. Here is the link to her blog post about it. I rearranged things in this post so you can compare Sandi's Keltic Krest with Kerry's Celtic Solstice. The red and purple in place of orange and blue is gorgeous! 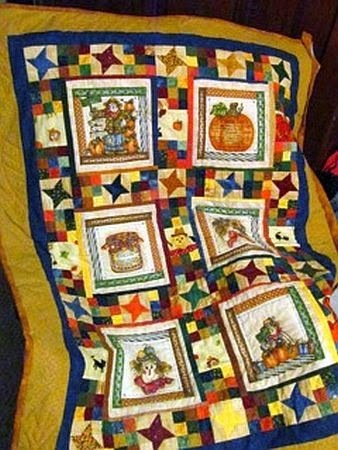 Go to her blog, Kerry's Quilting, to read the details. Be sure to click on the tab that reads "2013 Finishes" to see all the quilts she completed last year! I think this quilt by Irene is so appropriate. She says she was very busy in January because of a trip to the American Farm Bureau annual convention. I am a big fan of the Farm Bureau because a close friend in my high school class won the Farm Bureau scholarship! Aren't the "farm scenes" perfect? Irene posted details on her blog, A Serendipitous Retirement. Another first-time finisher, Betsy, completed not one, but three pillowcases this month. From bottom to top: a breast cancer case from a kit, a pieced and appliqued case from a kit I bought at the Houston Quilt show years ago, and a companion case for the middle one. It doesn't match exactly, but close enough. We'll use those two in my fiance's RV. Betsy, I think custom-made pillowcases will be lovely in the RV! I hope we'll see another finish by you next month. Returning finisher, Noela, submits this lovely Christmas project. 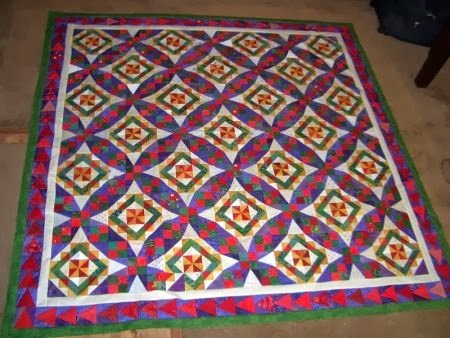 She says she is planning to do some hand-quilting on it and will use it for a table topper. 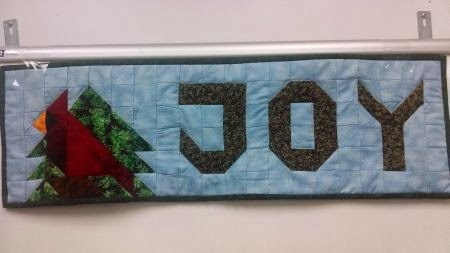 If you click on the photo so that it "biggies," you can see the hand-embroidered "Merry Christmas" around the central border. Notice the green grass and filled swimming pool in the background? Yep, Noela is from "Down Under," where they are "enjoying" a very hot summer while I am looking out at 5" of snow. Care to trade places, Noela? Debra B. sent in this photo of another Bonnie Hunter mystery (YES, they ARE addictive!). "Lazy Sunday" was featured in Quiltmaker magazine last year. I really like Deb's versions! Look closely at the photo -- can you see the little visitor in the upper left? It's Lola! So cute! Bonnie finished two of these disappearing 9-patches this month, in two colorways. Ahead of the game, Bonnie! 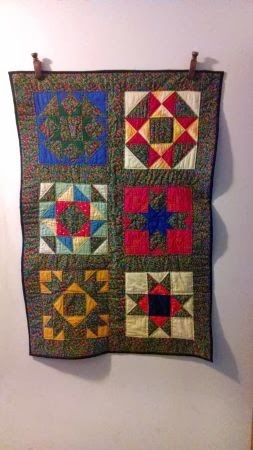 She says this is the first time she has shown her quilts outside the family, so I hope for lots of encouraging comments. 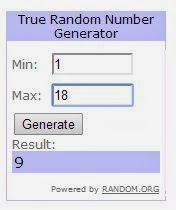 Eighteen entries this month! 52 Quilts followers completed 157 UFOs in 2013 -- it looks as though 2014 will be even more successful. And the 9th entry is newcomer Becky! Congratulations, Becky -- I'll be sending you an email asking for your postal address so I can send you something fun! I hope you will consider sending a photo of a finished UFO next month. 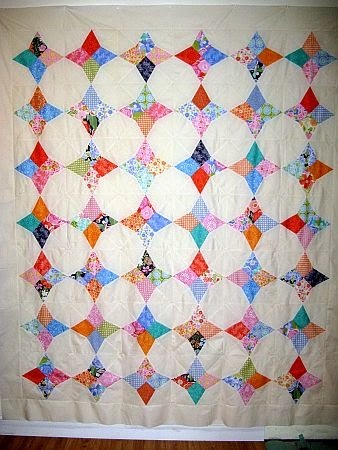 Email me at AuntMarti at 52 Quilts dot com and attach a photo and a link to your blog if you like. What an amazing quilt show! thanks Aunt Marti! I particularly admire the work that went into that T shirt quilt. I have never made one, but I can imagine what a challenge that must have been! Thanks, Kath. Once I got over the fear of making it, it just took patience and perseverance. I will make one again, but next time...I'll cut my own t-shirts to begin with! Wow!!! What an incredible start to 2014's UFO Parade! I love the colors in Sue's Star Surround. Complete Awe at Sandi's Keltic Krest and Kerry's Celtic Solstice (and Aunt Marti's, too!) Bonnie did such a great job on the disappearing 9 patch...You Go Girl! And I love, love, love Debra's Orca Bay! Really...you had beautiful scraps and they went together so well. But my favorite is Donna's Cardinal Wall Hanging. Then again, I might be a little biased, since it has my name all over it. 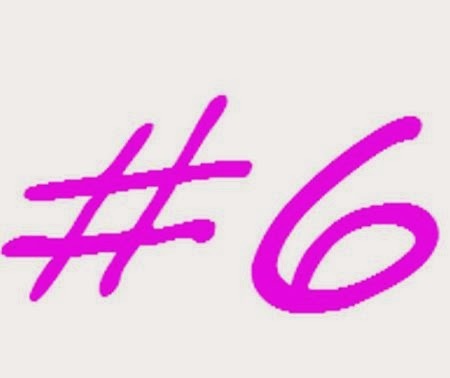 :) OK...up to work on #6...now where was I? Joy, one of my closest friends is also named "Joy." Guess I should ask Donna where she found the pattern, huh? If we could get the pattern, that would be great. If not, it looks like just half-square triangles. Good candidate for a quick and easy from the scrap collection!! Goodness is your machine on fire lol. Beautiful quilts there missis. Popping in from Lily quilts and GYB. What a great rollcall of UFO's! Great work everyone, welcome especially to the new UFO'ers! These are all lovely and I am just sitting around - actually finished one feather block for the McCall quilting group class. Gotta get going! 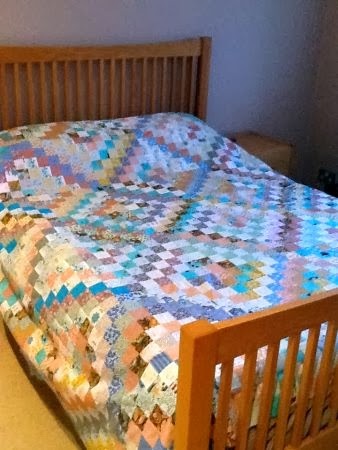 Martha, you made so many baby quilts last year, I think you're ahead of the game! Orca Bay and the D9Ps are my favorites this month. I love this monthly parade of finishes; I find it so inspiring and it encourages me to go out there and finish SomeThing, Any thing !~!